The World's Mightiest Mortal! : Captain Marvel's Most Embarrassing Moment! Captain Marvel's Most Embarrassing Moment! Let's face it, we all have embarrassing moments we would rather forget! Fortunately for us those moments are seen by relatively few people. In the pages of Whiz comics #50 we are able to have a look at Captain Marvel's most embarrassing moment! The fun begins on the very cover of this comic! 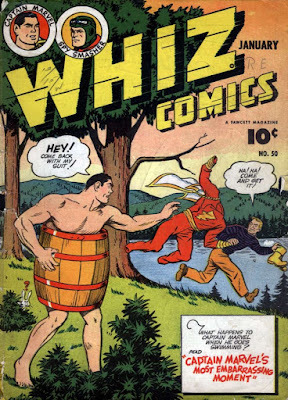 We see Captain Marvel dressed only in a barrel hollering at someone running away with his uniform. "Hey! Come back with my suit!" Cap shouts, while the costume snatcher taunts him with, "Ha! Ha! Come and get it!" The cover does a great job setting up the fun and adventure on the pages inside. The comic begins with Billy letting us in on a secret, he's finally going to tell us about Captain Marvel's most embarrassing moment. It all began when Billy took a summer vacation at a mountain resort. 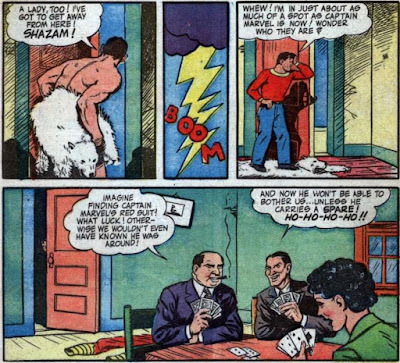 Billy almost falls off a bridge and says the magic word, "Shazam!" and transforms into the world's mightiest mortal. Captain Marvel notices how cool and refreshing the water looks and decides he can't resist the temptation to jump in for a swim. Cap hangs up his uniform and dives head first into the refreshing water. After some well-earned relaxation, Cap returns and is shocked to see someone has stolen the skinny-dipping super hero's uniform! Captain Marvel transforms back into Billy Batson and takes off hot on the trail of the uniform thief. A summer storm pops up and Billy looks for shelter in a house in the woods - he looks in the window and sees Cap's uniform draped over a chair inside. Under the cover of the thunder and wind, Billy sneaks in the window to recover Cap's clothes. Once inside, Billy transforms back into Cap but just as he's about to get his uniform it is blown into an adjacent room by a gust of storm wind. Cap covers up in a bear skin rug and creeps closer to the room. He hears voices coming from the room - and to his horror he hears the voice of a woman! "A lady, too! I've got to get away from here!" 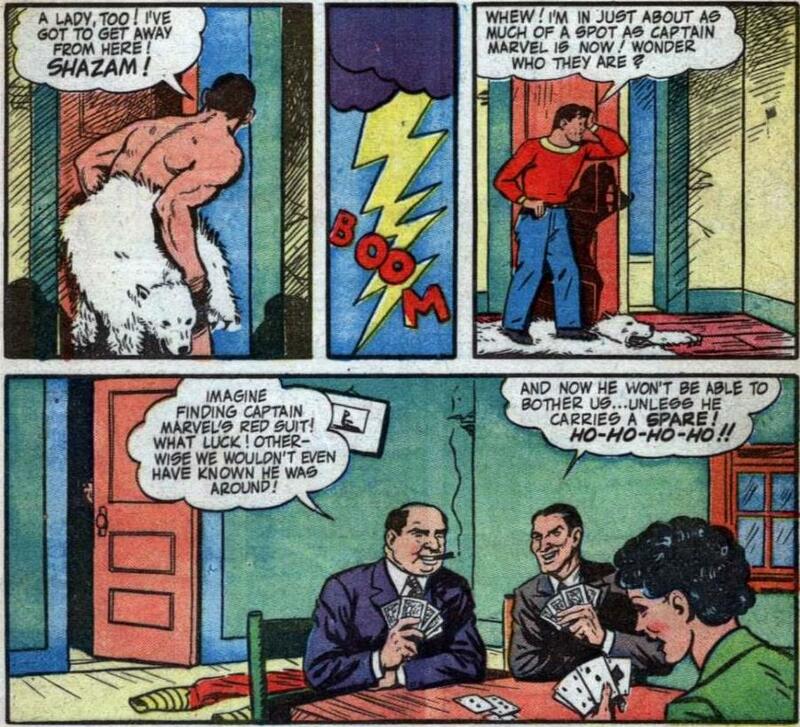 and with a "Shazam!" he transforms back to a fully clothed Billy. Eavesdropping on the voices in the room, Billy soon learns that Cap's uniform has been taken by a gang of 3 that plan on robbing the vacation resort. Since they have Captain Marvel's uniform, they don't expect him to interfere - unless he has a spare uniform!! 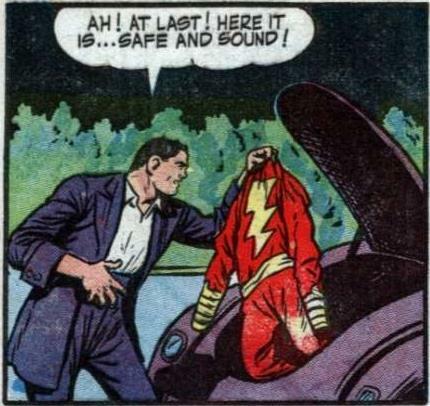 As the adventure continues and the drama unfolds, Billy finds a local tailor shop and tries to have a Captain Marvel uniform made. 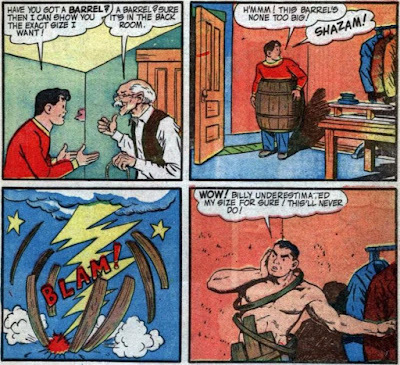 He tries transforming into Captain Marvel so the tailor can get the exact measurements, but ends up destroying the barrel he was trying to use to cover up Cap. Billy does find out from the tailor that there is a big masquerade party happening at the vacation resort. Billy heads back to the resort in an attempt to talk with the manager and warn him of the crooks' plans. Billy asks a doorman to speak to the manager but is unaware that the doorman is one of the gang of thieves! The doorman shows Billy the door to the manager's office and promptly locks him in. Hearing the gang members speaking just outside the door, Billy recognizes their voice and calls on Captain Marvel to get him out of the manager's office by busting a hole in the wall. 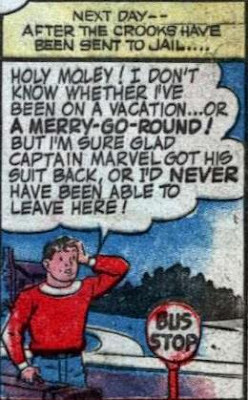 Billy finds one of the gang members on guard duty outside of the manager's office and with the help of Captain Marvel he captures the gang member. Not only does he get the gang member to let him know where his uniform is, he also uses the gangster's costume to go outside and retrieve his uniform! 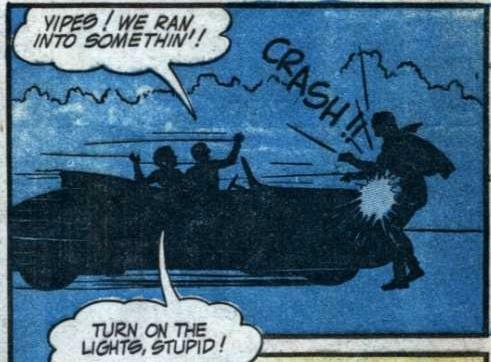 As the remaining gang members try to make a run for it, the run right into Captain Marvel. The story ends with the crooks in jail and Billy saying, "Holy Moley! I don't know whether I've been on a vacation or a merry-go-round!" This Captain Marvel adventure is one of my all-time favorites. It shows Captain Marvel and Billy Batson working together to solve a dilemma, with both of them needing each other. What was supposed to be a few moments of relaxation for the world's mightiest mortal turned into his most embarrassing moment, and I'm so glad Billy and Captain Marvel decided to share that with us!